Fellow Courtauld student Yasmin Siabi and I spent today submerged in Modern British and Contemporary Art at London Art Fair… with VIP access thanks to the generosity of George Stewart-Lockhart! Remember that name – he may just feature in one of our digiQualia interviews. However, my highlight had to be seeing three Mark Demsteaders in Panter & Hall. I can clearly remember the first time I became aware of Demsteader. I was about 15 years old and still harbouring a childhood crush on my big brother’s best friend. It was at their flat that I noticed a flyer for Demsteader. Being young, and impressionable, I quickly understood that this must be a very important artist. Especially if He had been to the show. And so began my love affair with figurative art. Five years on I have even had a little training in academic drawing and sculpture at The Florence Academy of Art! But as current Art History students, Yasmin and I were soon distracted by Nancy Fout’s reinterpretation of Millet’s The Angelus in Pertwee, Anderson & Gold. Other artists also explored the canon. Inspired by comics, the Gorillaz animators and modern technology, Paul Reid has been painting scenes from Greek Mythology. Hung by 108 Fine Art, Reid's classical compositions are large in scale. Such attention to anatomical detail instantly recalls salon style history paintings. Continuing on, we soon discovered digiQualia favourite Jack Bell Gallery had actually hung their selection in a traditional salon manner. Even landscape painter Marco Crivello, Four Square Fine Arts, acknowledged times gone by with a little gold leaf. 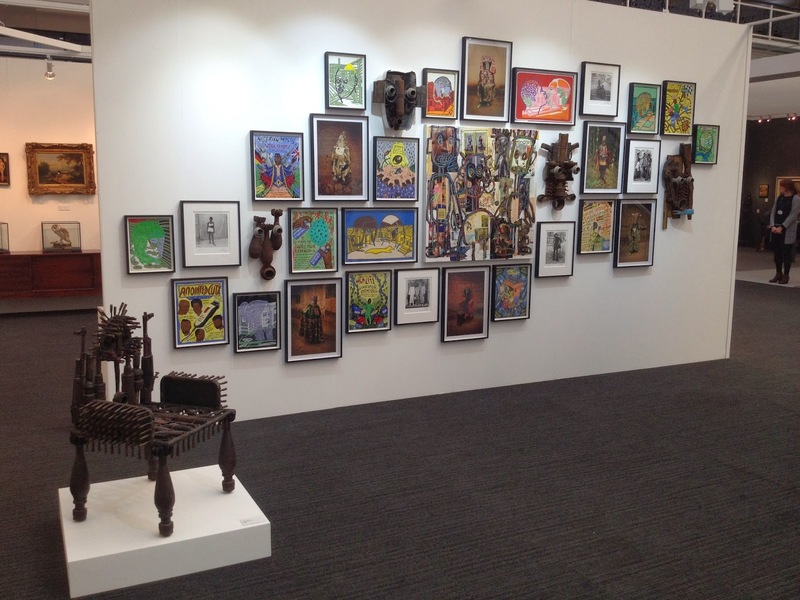 Yet, London Art Fair was rife with technical tricks. I first encountered this medium in 2012 whilst awaiting an interview. Enzo Guaricci’s marble balloons were installed at the Courtauld as part of the annual East Wing Bienalle. I was far too busy prodding them for any nervous nail-nibbling… but left wondering how marble appeared weightless. Until today. Cathy Lewis in Anthony Hepworth Gallery confirmed my suspicions. Casting a composite of marble powder and resin creates the illusion of carved stone. Done and dusted. To the sculptors out there, Anthony Hepworth also let me in on a trade secret – it is far more economical than bronze casting! Apparently, organic matter is also acceptable. As demonstrated by Anna Gilespie’s acorn and wooden figures at Beau Arts Bath. Truth be told, Gilespie doesn't deny bronze.